In ancient Rome crowds were getting crazy from shows of gladiators' fights. While gladiators are still alive in Turkmenistan. They have names and cause rapturous joy of the public. They fight to the bitter end and get just a dish of mess for the victory. Nobody is in hurry before the fight. The fighters do not show any hostility to each other. It seems the growing buzz and hoot of tribunes cause an opposite effect. The motions of those at who thousand of eyes are stared become slower and lazier. But this deliberate slowness only promotes the feeling of coming burst. So start the dogfights - ancient and carefully kept amusement of the Turkmen. It happens that everything ends at the very beginning of the fight. One of the rivals might not stand the force of the blow at the first crash and give up without any fight practically. But this rarely happens. It may happen when there is obvious disparity of the forces. To make the fight longer and harder, the dogs' masters select adequate rivals beforehand. Everything here occurs in accordance with the laws of a real big show. Its participants didn't pass their probation period at the Western producers; nevertheless, they're acting in strict accordance with the laws of the genre. The opening of the fights is made by the tyros. The boys, one after another, are pulling the jibbing debutants to the ring, many of which do not actually fit the classic characteristics of a pure-bred fighter. The tribune does not react so roughly to such fights. But experienced spectators will look thoroughly at awkward debutants. Some of them will show their real character today, will elevate their rating, will make their masters known and then next time will appear on the scene as favorites. It is worth of betting on it. The totalizator acts unofficially, nevertheless big money circulate here. The time of main fights comes after 2-hour warming-up. The duration of fights extends as well. 5-10 minute lasting fights are replaced with half an hour lasting fights. Everything depends on experience and perseverance of rivals. The appearance of the fight participants changes proportionally with the increase of the fights' difficulty. The top rating can reach only the fighter, the ambitions of which are confirmed by the best pedigree - big head, brawny shoulder-girdle, large, strong arms. Character is a pedigree feature as well. Slow and a little phlegmatic by appearance a dog transforms at the sight of the rival; his eyes are becoming bloodshot, there is a robust gurgle in its throat and fury is bursting out. A battle-hardened fighter never lets itself down to an oral skirmish. Only green tyros and mongrels are used to bark at their rival. The real fury and savage nature are bursting out only in the moment of fight. The fight has very simple rules: you will lose if you surrender: whimper, run away, or just show combating disability. Very rarely, the fights end in draw. It happens if rivals are worth of each other, if they have equal physical abilities and strong characters and prefer to die than to lose. of all forces, which dogs can have in a long-term fight. Masters of fighters understand it and try to avoid too long fights despite displeasure of spectators desiring to see the only triumph-winner. By the way, spectators of dogfights are a special category. They can be compared with the spectators of Spanish bullfight. The number of people enjoying such brute, sometimes bloody, fights is not so big. However if someone takes a fancy to it he will continue enjoying it completely. Dogfight is something nonofficial in Turkmenistan. Nature decorations somewhere in the countryside are used as combating rings. One cannot find advertisements about dogfights. The information is disseminated orally, nevertheless hundreds even thousands fans of "Turkmen corrida" catch the news immediately. Their emotions and excitement come out in extemporaneous tribunes. There were cases when fans were putting at stake the most precious things such as vehicles or private houses. But excitement is not the only thing that attracts people to dogfights. The majority of "fans" are inveterate dog keepers. As a matter of fact there are more than one dog in every house. And even if the pet is not good enough for participation in fights every dog keeper dreams about having a dog champion with hope to enjoy rays of honor and general recognition. The passion to dogs is deeply injected to the genetic memory of the nation. The Turkmen sort of Middle Asian sheep dog called alabay is one of the ancient dog breeds. Thus all external features of this breed can be seen on Shumer pictures of fighting dogs of army. In ancient nomadic life of Turkmen people wolfhound- alabays were keeping their herds from attacks of wild animals. 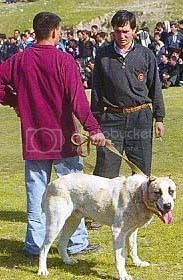 These dogs continue being reliable friends of Turkmen herders till now. Wolfs are not rare in Kara Kums. Herders cannot do without enduring strong dogs. Alabay is very suitable for continental life in deserts. Thick hair protects the dog from winter cold and summer heat. One cannot see the main assistant of the herder during the whole day. It digs a small moon in sands and gets rest there near the herd. 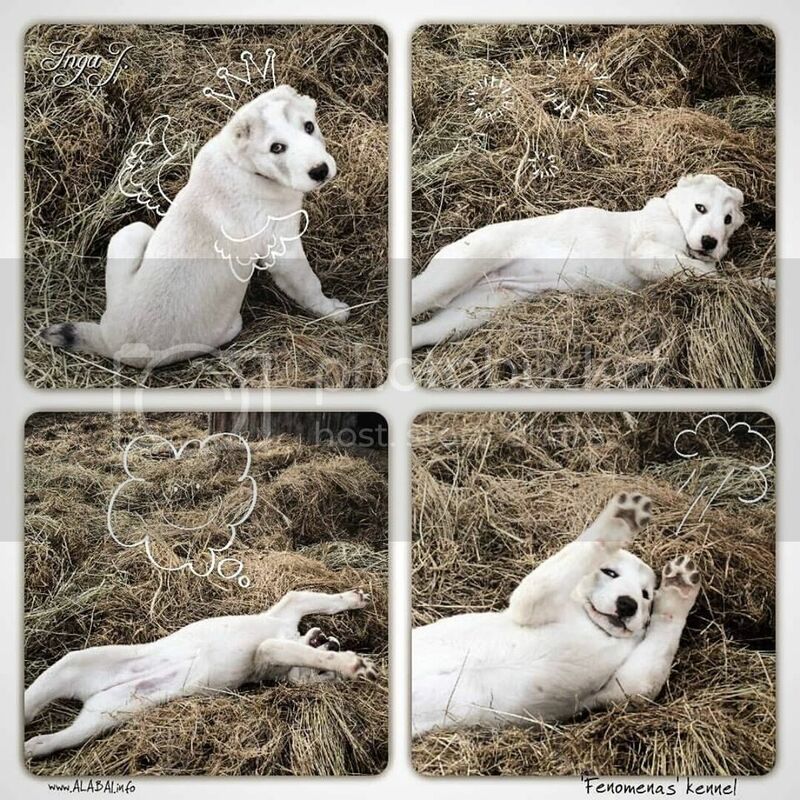 However, no strange sound stays without attention of the dog, which pretends to be sleeping. Alabay has very good ear and sense of smell, it can smell predator, which is 1 km far from the place, and raise an alarm. Night is the main time of alabay's work. It permanently guards both people and herd and in case of predators' attack it fights bravely against any enemy. Many legends are told near herder's fire honoring braveness and strength of alabays, which saved the herd and also the master. Ears and tails of pappies are cut off after they birth. It has noting to do with fashion it is a traditional condition for happy end in case of fight with wolfs. And today the cut ears and tails symbolize gladiator-dogs. Sincere and specific love Turkmen families have to dogs can be hardly compared with analogical entertainments of Europeans making some kind of fetish from their affections. 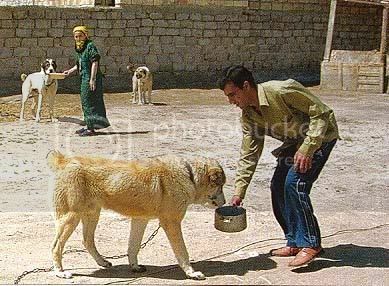 Turkmen will never allow to keep a dog in the home, he will not demonstrate publicly his abundantly affection to the pet. They have respective but brute attitude to dogs. Dog is not an entertainment it is a guard and fighter. It is hardly possible to keep such a dog in a flat that is why they are cultivated in private houses. Having an aim to attend such a home I deliberately prevent meeting those for whom dog keeping is a main business, i.e. masters of elite god champions, owners of real dog producing farms as their example cannot demonstrate national affection to alabays. In a rural suburb of Turkmen capital I met Bayramber Esenov's family. Bayramber works in town, however all his spare time is given to dogs. Their number always changes in a big yard of Bayramberd house. New puppies are born and given away from time to time. Grown-up dogs can be also given to others. Everything like real collection keepers do, something is sold something is exchanged. Volumes of collections are changed to multiply their number. There is also a pearl of the collection, a recognized master of the yard with numerous generations - an alabay named Boxer for its pugnacious behavior. The external appearance of the dog somehow differs from typical alabay. Nevertheless, its main advantage is the spirit of fighter, ability to endure fights. Boxer itself is too old for taking part in fights, however his generations continue the series of victories of their ancestor. By the way the name Boxer is not common for Turkmen traditions. Thus, one of the most known dog champions with very good generation in terms of both quality and quantity was named Agkush (white Bird). As a rule, dogs are given either poetic or amorous-ironical names. The affection to dogs came to Bairamberdi from his father Agali Esenov. All of his five sons have dogs; exchange them with each other, read their pedigrees. Dog keeping is not a family business for them; all of them have other main businesses. Nevertheless, the whole yard of Bairamberdi, which for instance can be used for cattle breeding, is given to dogs. Both wife and children of Bairamberdi care for dogs, breed them, take out of walks etc. Besides, they have many voluntary assistants. Children of neighbors are always glad to help and play with funny puppies. Time will pass and yet harmless and very funny tousled tot will turn into a menacing bully. It will be brought to a fight ring and obeying not special trainings but a century-old instinct, in an hour it will turn into a beast, will dash to the similar indomitable rival and tear and hack other flesh getting filled with its own blood and fury. And the audience will be wildly whistling, shouting and applauding. One can dispute whether this brute performance goes in line with human morality norms or not. Anyway such a show exists. And it seems to continue existing as long as alabay is alive - a creature, born a Beast that has become a Friend, but, thanks to a Man's will, it doesn't forget its being still a Beast.